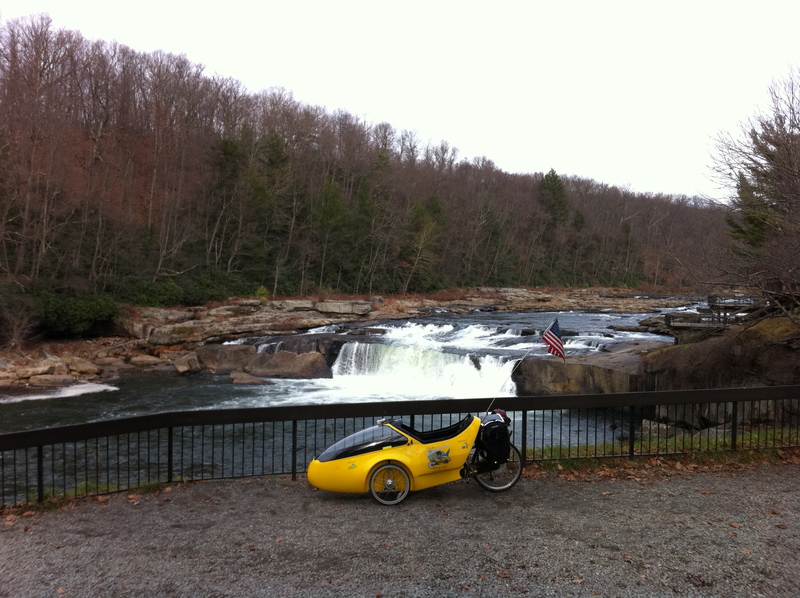 Rolled down to a local cafe for a hearty breakfast, then across the street to check out OhioPyle Falls. Stunningly beautiful. I can see why so many outdoor enthusiasts gravitate to this little Pennsylvania town. Spent the day pedaling the trail, first along the beautiful Youghiogheny, then Casselman, Rivers. Feeling strong and ripped off some serious miles this morning. Near the little town of Garrett, was excited to spy a large wind turbine on the horizon through the trees. Saw a few more turbines as I came to the town, so headed up a country road in search of the project. The hill was so steep I had to push the trike up part of it, but I was determined to get closer. Pedaled a few miles further and made a good guess on a side road which took me right smack into the middle of the project. Surrounding me were 30 megawatts of wind projects, all I believe developed by Florida Power & Light, including one sited on land reclaimed from a coal strip mine. It was a beautiful sight to behold. Turning around to pedal back down the hill, I was met by a dozen or more turbines a few ridges away. Was graced by a regal-looking hawk alighting on a branch above me as I pedaled towards the project. I’m guessing it was the same one who flew close to me again near the same location on my way back. About an hour before sunset, rolled into Meyersdale with 49 more miles behind me. Hadn’t run into a single biker all day until one mile outside of Meyersdale, which was kind of nice. There were no campgrounds in town, but lucked out finding an affordable room. Best not to camp tonight anyway, with my core body temperature dropping so low. Riding in the low 40s is comfortable enough, but when you stop, soaked in sweat, your body really feels the cold. A hot shower quickly cured that. Given the weather forecast for tomorrow (cold and rainy), think I may hole up here for Thanksgiving and spend some time reflecting on everything I’m thankful for in my life. I’m particularly grateful to have a roof over my head tonight. Poked my head out the door just before going to bed and saw the rain had turned to sleet. Definitely sticking around tomorrow. This entry was posted in 2010 Ride, Blog, Video and tagged ohio pyle, pennsylvania, ride for renewables, wind turbine. Bookmark the permalink.